a phalanx of what were then called bi-planes, each piloted by a single woman, having taken off from a field in Staten Island [see my October 10th blog: “New York: Aviation Pioneer” for more on women aviators]. The aviatrixes hovered above the yacht, following its course, then criss-crossed the river, bank to bank. From each open aircraft floated bits of paper, like doves descending, but these messages urged not peace, but increasing militancy of the feminist kind. “Votes for Women” the leaflets said. The story of how women in New York and the rest of the United States finally succeeded in gaining the vote is an exciting and important historical narrative, though familiar to almost none of my college students or even my colleagues. In fact, students are far more likely to have heard of New York’s Seneca Falls Convention of 1848, where Stanton announced resolutions demanding the vote, than to have any idea how the vote was finally won after decades of struggle. If they are aware of the final push for women’s suffrage during World War I, they are more likely to be familiar with radical leader Alice Paul and the National Woman’s Party (NWP). Paul and her followers picketed the White House, were jailed repeatedly, demanded to be treated as political prisoners, went on hunger strikes, and were force-fed and sometimes physically abused in jail. However, I would argue that Paul and her organization—though courageous and important—were not primarily responsible for winning the vote for women, either in New York State or nationally. Instead, I would like to credit a different woman with both the New York and U.S. victories: Carrie Chapman Catt. A board of wealthy women devoted themselves full time to the cause, creating a well-financed lobbying, advertising, and political organization. Headquartered on two floors of a Manhattan skyscraper, they deployed the latest technologies to persuade Americans of women’s right to vote and maintained transnational and intercontinental connections. They transformed NAWSA into a modern, urban, cosmopolitan lobby for women’s right to vote. Catt’s commitment to women’s rights was life-long, but went through several phases. She had been tapped by Susan B. Anthony to head NAWSA in 1900, but left that post after the death of her husband to travel in Europe and promote women’s rights internationally. Under the leadership of Anna Howard Shaw, the organization was troubled with internal dissention. In 1914, Miriam Leslie, editor and head of a publishing empire, left almost one million dollars specifically and personally to Catt for the cause of women’s suffrage. Then, in 1915, Catt returned to lead NAWSA to victory. An enormously ambitious house-to-house canvass was the main feature of the 1917 campaign in New York. 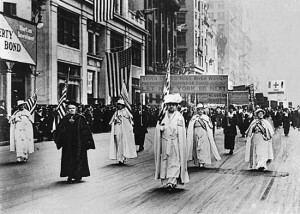 The tactic was diplomatically chosen, Mary Peck noted, because “it demanded service from every worker, did not offend sensitive patriots as more spectacular efforts would have done, and reached into individual homes as meetings never could.” To answer charges by opponents that most women did not want to vote, suffragists spent more than a year going door-to-door in nearly every city and town in the state, collecting the signatures of over one million women who said that they wanted to vote. Organizers climbed thousands of tenement stairs, walked country lanes, and visited the homes of the rich and poor. The result was the largest individually-signed petition ever assembled, eventually totaling 1,030,000 names, a majority of the women in the state. Remember that our country is fighting for democracy, for the right of those who submit to authority to have a voice in their own government. 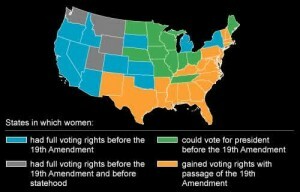 Vote for woman suffrage, because it is part of the struggle toward democracy. In the end, suffrage won in every borough, and the large majority in the city overcame a slight loss upstate, so that the measure carried by more than 100,000 votes statewide. Suffrage won in Auburn, Binghamton, Buffalo, Newburgh, Ossining, Oswego, Schenectady, Syracuse, and Westchester, but lost in Albany, Kingston, and Rochester. Both “Colonel” (former president Teddy) Roosevelt and William Randolph Hearst hailed the victory. Of course, Catt was not the only individual responsible for the ultimate success of the women’s suffrage campaign in New York, just as Martin Luther King was not the only person responsible for the success of the Civil Rights Movement. In particular, Catt’s colleague and partner Mary Garrett Hay was vital to the New York victory, as were thousands of other organizers, not to mention the men who supported them, some to the tune of $10,000 contributions. Yet, at the very least, the name of Carrie Chapman Catt, and the story of how women won the vote in New York surely deserve greater recognition than they currently enjoy. In honor of the upcoming centennial in 2017, CRREO (the Center for Research, Regional Education and Outreach) and the Women’s, Gender, and Sexuality Studies Program at SUNY New Paltz have just begun planning for a state-wide academic conference. By the end of that year, we hope that the story of women’s struggle for suffrage in New York State will be much better known than it is today. If you have suggestions or would like to be part of the process, please contact me at lewiss@newpaltz.edu. Louise Bernikow, “Lady Liberty: A Counter-Narrative,” The Huffington Post, Posted: 07/04/2013 8:39 am. Louise Bernikow, NYC SUFFRAGE VICTORY, 1917, Lecture Programs and Books. SUFFRAGISTS MAKE FINAL STATE APPEAL: Great Promise of Victory in New York, Says Mrs. Carrie Chapman Catt. SOLDIERS GIVE APPROVAL Whole Company of 71st Infantry Pledge Support and Attacks the Antis in a Letter. New York Times (1857-1922) [New York, N.Y] 05 Nov 1917: 15. Historical New York Times database. 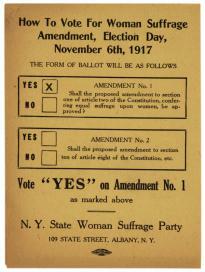 SUFFRAGE MADE GAINS UP-STATE: Syracuse Reversed Its Verdict of Two Years Ago and Gave Majority to Amendment. ROCHESTER STILL AGAINST Westchester Gave Votes for Women 5,000 Majority–Suffrage Won 5,000 Majority–Suffrage Won Schenectady County. Westchester 5,000 for Suffrage. Buffalo’s Big Overturn. Special to The New York Times.. New York Times (1857-1922) [New York, N.Y] 07 Nov 1917: 3. Historical New York Times database. Stealing the aeroplane story for class. That’s a hell of an opener. Please keep me informed of your plans for an academic conference. I am a Professor Emeritus from Southern Connecticut State University and have written two books on suffrage memorabilia. You might be interested in my site on the subject http://womansuffragememorabilia.com/ One August 17-19, I will be giving a series of presentations on suffrage memorabilia, including that of items from the NY State Campaigns, at the Susan B. Anthony House in Rochester. If you would like to see items from this campaign, I would be delighted to bring them with me to the conference. Thank you so much for getting in touch with us. I think that this would be wonderful for our conference but must consult with the committee. We haven’t talked yet about having displays or book tables but we need to! I will follow up. Great article, important occasion! I’m a musicologist and member of the Ithaca, NY performing group Women’s Works. The composer Kathleen Ballantyne has recently written a fine choral work for us using a suffragist text by Stanton et. al. Not sure how disciplinary your conference will be…but this piece is pleasant to listen to, it makes the words clear and memorable, and it is 100% New York State, as it merges 19th-century texts from Seneca Falls with 21st century music by an upstate NY composer. Thank you for sharing this, Jennifer. Actually, our conference will focus on the past, present, and future of women’s political rights, but the section on the past will look specifically at how women won the vote in New York State in 1917, and the leaders (less well known than Stanton, Anthony, or even Gage)who led the early 20th century struggle. I was recently given some letters written between my great uncle and his family during WWI. I read one from my grandmother stating that it was registration day and that she and her sister were going to vote for Al Smith. I didn’t think anything of it until today when I thought, “Wait a second. How did she vote in 1918?” I Googled it and your article popped up. I wish you had included more on the actual 1917 New York right to vote and how things changed, rather than the same old suffrage campaign facts. It did, however, answer my original question. Why Not Get the Original list of ALL NY Women who Voted in 1917 Put out Newpaper Article (Historical Tribute) (Try to reach relatives of those) and get them to come to Convention in Seneca Fall NY (I want a Landslide of Women there Celebrating 100 years ANNIVERSARY of Women Vote)! THIS is HUGE and will Propel Women Obtaining the ERA VOTE for the Country! I just moved back to NY (Im native) from MA and would LOVE to be on these committees. I was Juror for EC Stanton s Home for Student Competition of American Society of Landscape Architect. Im also on linkedin.com . I attended the Capital Suffragette Tour and was decent but they did not have copy of Declaration of Sentiments Critical to HERStory! Dear A. Flynn, at the time I wrote this article, research on the suffrage centennial was just beginning. There is now a book on Anti-Suffrage in New York (NO VOTES FOR WOMEN by Susan Goodier, 2013), and Goodier and Karen Pastorello are working on a book about the New York suffrage campaign, but it isn’t yet published. I expect that there will be a flurry of publications about how women won the vote in New York (and elsewhere) in the next three years. Our upcoming conference at SUNY New Paltz on April 21-22, 2017, will include a panel designed to address the question of why New York suffragists were victorious in 1917, as well as what individuals or groups and which tactics were most responsible for the victory. The registration for the event has not opened up yet, but it will be up shortly! Sorry for the inconvenience. If you need more information about the conference, or to inquire as to when the registration will open (I’m not sure myself), please email: crreo@newpaltz.edu . Thank you for your interest, and we’ll see you at the conference! A Convention Will be held in Seneca Falls NY NPS July 14-16 Please attend all! I believe a women named Lucy Stone, Beverly MA was also instrumental in the Women’s Vote. She originally started the Women’s Journal& I understand that her & Stanton first did not get along, but later worked together to get the national Vote! So important to work together to get it done like #PASSERA this would be a Great Achievement for Women in USA and Positive Affirmation to Americans! I do hope your event will not be titled “100 years ANNIVERSARY of NY WOMEN VOTES! ” That would not be accurate! In my point of view, inequality has been focused towards human’s genders. Especially during the ancient and historic times. As the story goes, women were treated as someone who just stays at home or an object that has no right to live, make decisions and be respected as an equal human living. It is very refreshing that as time passes by there are labor lawyers especially here in my country the Philippines who protects employees’ rights and ensures they receive proper treatment from employers. I came across an article in a Schenectady Reflector, April 15, 1880 that said because of a new law women were now allowed to vote in the Albany charter election for school board. Wass this a strictly local event or statewide? Sorry, I don’t know! The rules for women voting were usually state-wide, I believe, but you should ask Karen Pastorello at Tomkins-Corland Community College.